Classroom hacks are loosely defined as anything that you can do to make your life easier or anything that can be repurposed outside of its intended use, for your benefit. If you do a search for classroom hacks on Pinterest, you will find tons of different ways to repurpose items in your room. 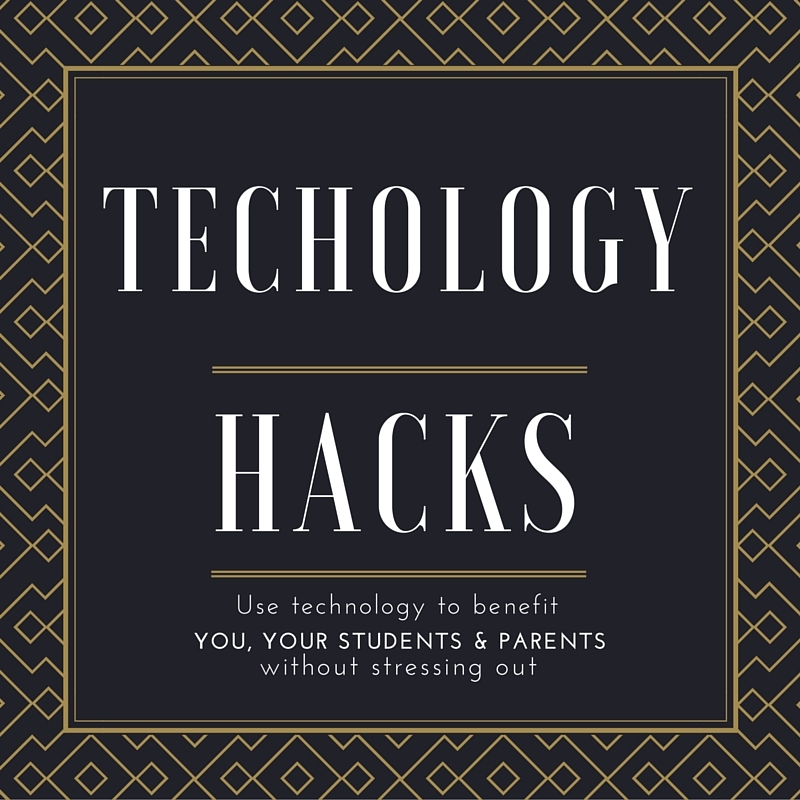 If you Google “Educational Technology Hacks” you will get ideas that you had never thought about. Hacks can be fun and exciting to explore – they help us get creative juices flowing. What if you could assess students by waving your phone or iPad? What if you could easily put together collections of online resources for student access? What if you need your students to work for 15 minutes while you take care of an unplanned event? What if all of this was easy? That is the hack. The list of apps and websites listed are simple to get started on, yet complex enough to provide constant learning. They can help you be more productive. They can help you organize. They can help your students easily engage in the world around them. They are just the beginning. Once you discover a few hacks, its hard to stop looking for them. You may not feel comfortable with all of the different apps and websites – that is fine. Find a website or app that suits you and start using it. Some of these apps and websites have similar missions, choose the one that feels right. Explore. Wander around. Click stuff. Make it work for you. Hack educational technology. What exactly is Evernote? It is an app/website that allows you to take notes, tag them with keywords, sort them into different notebooks and sync across any connected device. What can you do with Evernote? In a word – everything. Organize your lessons electronically and save them for future use. Pocket is an app and a website that can be used to bookmark different websites. This platform provides many different ways to save something: you can email, use the webclipper, or use one of the 1500 apps that will connect to Pocket. Alternately if you are on a computer, you can click the plus sign and save a url directly into pocket. Pocket was created to save things in your “pocket” to go back and look at later. As teachers we are always coming across stuff we want to revisit – Pocket was designed just for this reason. Diigo is Pocket on steroids. It also has a different overall goal – yes it wants to save items for you to review later BUT it also allows you to do so many other things. Find some text that stands out? Highlight it. See something on a web page that makes you think? Create a sticky note with your thoughts. Want to save that url? Go right ahead – then add some tags and a brief description to easily come back to at a later date. Doing some research? Use the Diigo outliner to sort out your work. You can even take a screen shot. All this and you can share with others. Join a group people who teach what you teach or have similar interests. Create your own group for your classroom. Diigo has a bookmarklet that does all of this for you. Organizing your internet has never been so easy. When you need to organize your thoughts, use bubbl.us to brainstorm. Or put up a piece of text and have your student give their thinking and how things are related. Either way, you will have a visual representation, a mind map, of that particular topic. The free account will give you three different mind maps, this may sound limiting but you can download them as images for future use. As you add bubbles connect them with lines and add important text on those connections. You can also create different folders to organize your work. If you upgrade to the educator pricing or one of the other available options, you can import pictures into your map. Similar to bubbl.us but gives you the opportunity to add some basic images from their stock. Images and other items can be uploaded (with an upgrade) but don’t let that hamper your efforts. Create up to three mind maps for free, then download them as PDF’s or image files. Again, with an upgrade, you have other options as well. Mindmeister is different than bubbl.us in that your creations can have a bit more creativity in the look and feel. There is nothing quite like Flipboard. Nothing. It looks great on a computer, it is amazing as tablet app. On your computer you can scroll through the news, each item attached with a picture. Click what you want to read more about. Heart what you like. The amazing things with Flipboard is that it will adjust what it shows you based on your hearts. Or you can explore and look through all kinds of different topics – find ones that fit you. On the tablet (I use an iPad) Flipboard is incredible. You swipe through and the pages flip. Want to read more on an article? Just tap it. You can also curate your own items and share them with the world. Livebinders is the digital version of the three ring binder sitting on your shelf. The free account gives you the opportunity to organize five different binders that will go two tabs deep. Lets use math as an example: I can create a binder for Precalculus. Tab level one will be where I organize by chapter, tab two will be where I organize by section. Inside each section I can upload PDFs (there is a limit to uploads), embed links to online videos, or create mini-lessons with relevant web pages. Once these things have been added and your binder is ready, it can be shared through several different platforms. You can tag your binders with keywords for easy searching, change the colors or layout, add a cover image…These are excellent for organizing your class by topic and providing an opportunity for students to seek out support from home. This will also let parents see what you are working on, so they can support you as well. Teachers have favorite apps. Sometimes we want our favorite apps to cooperate with each other and play nice together. IFTTT does just that. By connecting thousands of different apps together in a recipe, you have an “if this then that” command. For example, and I am not making this up, if you have a fitbit and use the WeMo Coffee Maker Channel you can set your coffee to brew automatically. Or post Instagram pictures to Tumblr. Or sync your Facebook and Twitter profile pictures. Or change your Android wallpaper to the NASA image of the day or even Tweet NASA’s picture of the day. The possibilities are endless. Padlet is a live poster board platform that is both website and app. Once you have a Padlet account you can create a variety of boards for any occasion. The nice thing is that each student can share without having to wait to be called on by the teacher. Everyone can contribute to the conversation. And you are not limited to class time only, if someone has a great idea, or remembers something important, they can add it to the Padlet at any time. Students can post links to websites, upload audio or video, or share a few words. Give them a prompt and turn them loose. All students need to participate is a connected device and the url of your padlet. Tackk has also has a website and mobile apps and can be connected to Edmodo is a partner with Google Edu. This can make it simple for your students to start using Tackk. What is Tackk? It is a lot…It can be an easy way to blog, it can be used for discussion, you can make (or have the students make) a classroom newsletter, you can create a class board to show off great things your students have done…the list goes on and on. Tackk is not difficult to use and allows students (or your) to add a variety of media. Just finished a lesson on Space? Have the students create a Tackk to show you what they learned. Time to discuss a book? Have students create a Tackk from a particular characters point of view. Learning about cool countries in Geography? Have students create a board with information about that particular place. You could also create a board with a driving question for the day and have students leave their comments. This can be a great opportunity to teach digital citizenship. What is a backchannel? It’s the conversation happening about the teaching that is happening. How does this look? An example: A history teacher is talking about the beginning of World War I. As the teacher is explaining the many things that happened, students can post questions, share a link to relevant websites, and post an image from that time in history. Not only is the teacher discussion World War I, now the students are. Backchannel gives every student a voice, even the really shy ones. TodaysMeet is an excellent space to host a classroom backchannel. Rooms that are created can be open from one hour all the way up to one year. You can password protect your room to keep it private for students. You can set options for who can see the room. And TodaysMeet has recently added a Teacher Upgrade, for $5/month or $57/year you can get these features: pause the conversation, downloadable transcripts, embed the room in your LMS, mute unruly students, add a topic or prompt. Blogging sounds intimidating and difficult. Nothing could be further from the truth. It can be as simpler or as complicated as you want. Blogging gives the teacher an opportunity to reflect and seek input on ideas from others. We often tell our students that two heads are better than one when trying to solve problems. Blogging for teachers can do the same thing. Have an idea and need some input? Blog about it. Read blogs by others to get ideas. Leave comments or questions on those blogs. Develop a community. WordPress makes it easy to get started. Create your free account and pick a template. Start writing. Blogging for students can be really beneficial as well. When they have the opportunity to reflect on what they are doing in your classroom and comment on each other’s posts, the classroom becomes a community. Blogger is similar to WordPress with a couple of big differences: it is under the Google umbrella and there is not as much creative license. Blogger is easy to use and easy to get started. Should you use WordPress or Blogger? Both give you a place to start blogging. Both give you some customization to make the space yours. Both allow multiples ways to share. Go with what feels right for you. This site will give you the control and the privacy that you want for your students. Students who are in early elementary can start their own blog, which can be shared with parents, the world, or just your class. Each student can make their blogspace their own with some simple customization. What can students blog? Have them blog to their parents for parent teacher conferences. Have them blog about the struggle they are having with a particular math problem. Have them blog about the amazing idea they had during science class. The sky is the limit. Have students share what is going on in class next week – take something off of your plate! Twitter is an online microblogging website. You have 140 characters to communicate your idea – that is it. Anything past the 140 and you cannot send your tweet. Why should you consider Twitter as a hack? Because there are great ideas just waiting to be discovered, things you can use tomorrow in your classroom. Ideas tried by teachers that you can tweak and implement right away. Twitter chats occur at scheduled times throughout the week. These chats allow teachers to trade ideas and build community. Use Twitter in your classroom to let parents know what happened that day. Use Twitter with your students by developing a class hashtag, where everyone can share links, video, and ideas. Have a class discussion – but only on Twitter. This gives all students a voice. Post a question with your class hashtag. Have students answer it. This will also give you the opportunity to help students develop as digital citizens. Tumblr gives you the opportunity to share anything. Create a class Tumblr account and share what you are doing. Did you do a worksheet today? Take a pic and share it. Find a cool diagram that the students need to see? Share the link. Want to have a class discussion on a particular topic? Post a picture with a caption and have the students respond. Post several pictures. Getting tired of typing up the weekly announcements? Post audio or video of those announcements. Let the students do it…Another place to teach our students how to be good digital citizens. Flickr is a photo sharing website that gives you a ton of space to use, one TB to be exact. Use your Yahoo username to get your Flickr account started, create a private group, start sharing pictures. Use Flickr Map to explore places all over the globe. Students can use Flickr images as part of their research projects – there is an entire section devoted to free use called The Commons. Join a teacher group and build community with teachers from all over. Or take pictures of the cool things that kids are doing in your class and share them with your parents. Periscope allows you to create a streaming video and share it with your followers. The video is available for 24 hours, then it goes away. How can you use this? Point your phone toward the ceiling (so student faces are not visible) and have a discussion. This will give your parents an opportunity to see what is happening in your classroom. Have students create and share daily news bulletins. Have students do shark tank style pitches for their ideas. Reach out to an “expert” in “whatever” set up a time to Periscope with class. You can even stream breaking news, if appropriate for where your class is. What is the hack with Periscope? A very quick way to share/view video. Mystery Skypes bring the world to your students and add a bit of mystery. Arrange a Skype time with a teacher from another location, then see if your students can guess where your guest is from. Tell your students who your mystery skype person is and have them write questions to ask. This is a great opportunity for students to learn about different cultures and countries, you can break down the four walls of your classroom without ever leaving. Remind gives you the ability to message large groups of people at one time, but these messages go one way only. Getting your parents signed up is quick and easy. Sending a message is simple and can be done right from your phone. Create a Remind group for the staff in your building to quickly send out important information. Use this with older students to Remind them of things that are coming up in your class. Create your weekly newsletters with smore.com. Click to start a new flyer, choose the template that best works for you, then create. Once your flyer is ready to go, share it through all of the different social media sites that you have. Share events, news bulletin, class activity, or anything else you can think of. This is a free website that teachers can use to create podcasts. Why podcasts? Parents can listen to your weekly news while they are in the car. You can share extra information with your students and they can listen as many times as they need to. And so much more – without having to do a ton of editing. Free account has unlimited uploads with a max time of 10 minutes. For $10/month or $90/year you can have a max time of one hour and full iTunes integration. Download the Audioboom app for your phone, then record and submit. It’s that easy. Scanning this code will take you to Kathy Schrock’s Guide to Everything and land you on her QR Code Page. Why QR Codes? You can create a scavenger hunt in your room or building. You can give students links to different websites to explore. You can tie student work with specific QR Codes and parents can scan them on Open House Night. Create learning stations for self-directed learning. Have your classroom calendar assigned to a QR Code, then add that code to your email signature. Put a QR Code that is linked to a learning video next to an example on a worksheet. There are so many ways to use them – you are limited by imagination only. They are not hard to create either: copy a url, paste it in a QR Code generator, download the code. There are two different apps: one for teachers and one for students. The teacher app allows you to create a formative assessment – there are several different question types to choose from. Once you have your questions ready, you can share them with your class and you have choice: student paced or teacher paced. As students answer questions you get real time feedback allowing you to tailor instruction directly to your students. With Poll Everywhere all students need is an internet connected device. No separate apps, no accounts. To participate all students need to do is send a text message to a specific number. You can embed Poll Everywhere into Powerpoint and Keynote presentations or share quizzes from the website. The fun thing with Poll Everywhere is that everyone can see real time feedback. This allows the class to know what areas are more challenging and gives the teacher the opportunity to address those areas. Bar trivia for students. No, seriously. Teachers create questions, give them a specific time limit from a few seconds to two minutes, and share with the class. Students earn more points for answering questions quickly and earn fewer points for answering slowly. Teachers can create survey’s, quizzes, or discussions. Quizzes are where the points come into play. Students can work in groups or individually all they need is an internet connected device. This is an app for your Android or iPhone. It is free to download and with that you get 100 uses. There are several very reasonable pricing plans available if you like the app. Create the quizzes inside the app on your mobile device, print the answer sheet from zipgrade.com, then scan the answer sheets with your phone. Super fast. Wow. Just WOW! I will let Zooniverse describe Zoonivers – “The Zooniverse is the world’s largest and most popular platform for people-powered research.” This site is amazing and allows students to contribute to science. Something come up in class and you need 15 minutes undistracted? Put zooniverse.org on the overhead and let the students explore. If each student has an internet connected device – even better. Students can get into the website without registering. They just click a project and follow the instructions. Student can collaborate with researchers in the field, contribute to new research, and explore the universe! Check out Chimp & See or Sunspotter, maybe Penguin Spotter or Fossil Finder. The world is waiting for you and your students to discover it. A truly unique and wonderful website – not only will students learn while participating, but for every correct answer, they will donate rice to the United Nations World Food Program. This website has two state goals: 1) Provide a free education to everyone; 2) Help end world hunger by providing rice to hungry people for free. If you create an account, you can track your progress. Create an account for your school (everyone uses the same login) and see how much rice you can donate. This is perfect for those times when you need something for the students to do when your day has gone awry and the planned lesson won’t work. Ever wonder “What is a coat of arms?” or “How do you make paper from a tree?” Wonder no more, click over to wonderoplis.org and learn, learn, learn. There are over 400 Wonder Guides and over 1600 Wonders of the Day. Wonders are also broken down by categories: Math, Science, Social Studies, Language Arts, Technology, and Arts and Culture. Each wonder has video, highlighted vocabulary words, knowledge test, a wonder word challenge, a Try it Out section, and source links. One Response to "Technology Hacks for Educators"
Socrative is launching a paid upgrade – Socrative Pro. Instead of one classroom, you can manage multiple classrooms.